In the 1840 Madison County Missouri census I find a Timothy Ragan, with two males and one female aged 0-5, two males aged 5-10, one male and one female aged 10-15, a male aged 40-50 and a female aged 30-40. I'll have to check and see who he is. Brothers John and Ahimaaz Reagan who came to Missouri from Tennessee with their families didn't have a son named Timothy. In the Newton County, 1840, Sugar Creek Township, I find Elizabeth Ragen. In her household, there is one male, 0-5, one 10-15, two 15-20 and one 20-30. And one female 5-10 and one 60-70. Both John and Ahimaaz had daughters name Elizabeth, but the age doesn't check out for either (b. 1792 and 1811). In the 1850 Dade County federal census, I find Martha Ragan, 19, born in Tennessee in the household of Daniel M. Stockton, 56, M, Farmer, VA. Martha (b. 1831) is the daughter of William Henry Reagan and Margaret Cunard (b. 1803 in France, died Jan. 8, 1846 in Dade County). By 1850, William was also dead, but I don't have a date. So, Martha, unmarried daughter, had to go live with someone else. William Henry Reagan's brother, is also in the 1840 Barry census. Black became a popular middle name. John and Martha, parents to William Henry Reagan, had a son John Black Reagan born in 1814 (or 1809?). Ahimaaz and Rebecca (Rebecca died in Cass County Texas in 1850) had a son John Black Reagan in 1800 and Joseph Black Reagan in 1809 (the latter emigrated to Cass County, Texas along with his parents). The last John Black Reagan I find was the one born to Joseph Vance Reagan and Martha Black (a different Martha, no doubt) on Jan. 8, 1839. Joseph Vance Reagan was the son of John Reagan and Martha Black and brother to William Henry. Interestingly, I have a note that Martha was Joseph's second of three wives. BUT, also in the 1850 Dade census is John B. Reagan, 36, M, Farmer, TN. This would put him born in 1814. This could very well be the brother of William Henry Reagan, born 1814 instead of 1809, like some databases show. Confused? Me, too. In his family was Martha, 27, (another Martha Black?) and Marg (or Mary), 14, all born in Tennessee. The rest of the children were born in Missouri: James, 13, William, 10, twins Joseph and Charles, 8, Emily, 3, and John, 3 months. 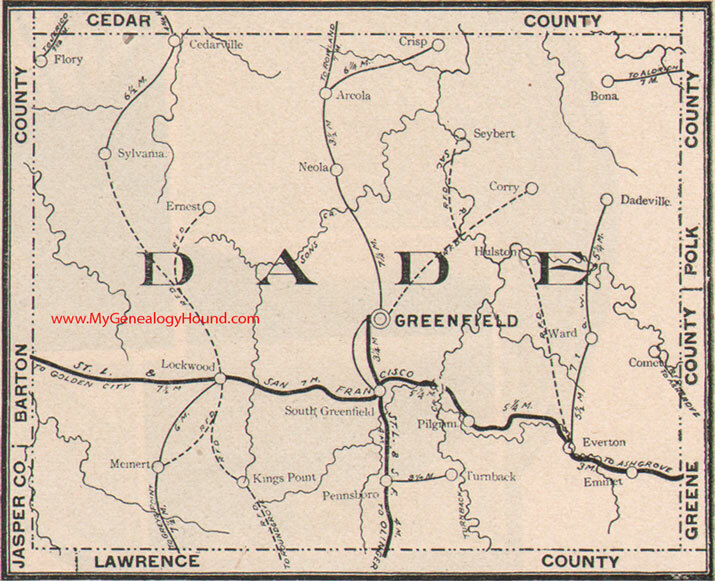 The only other Ragans I find in Dade County in 1850 are Joseph, 49, and Eliza Ragan, 39. They are both black and born in Tennessee. They may have been former slaves of John or William Henry Reagan's freed in a last will and testament.